South San Francisco, CA, Nov. 12, 2018 – NGM Biopharmaceuticals, Inc., a clinical stage biotechnology company focused on harnessing powerful biology to develop transformative therapeutics for patients, today announced preliminary results from a Phase 1b proof-of-concept clinical trial of NGM313 in obese, insulin resistant subjects with nonalcoholic fatty liver disease (NAFLD). The data demonstrated that a single dose of NGM313, a proprietary, investigational agonistic antibody that selectively activates the β-Klotho/FGFR1c receptor complex, resulted in a statistically significant reduction in liver fat content (LFC) and improvements in multiple metabolic parameters. The data, which will be presented today during a late breaker poster session at AASLD’s The Liver Meeting® 2018 in San Francisco, support NGM313’s potential as an insulin sensitizer for the treatment of nonalcoholic steatohepatitis (NASH) and type 2 diabetes dosed once-monthly. In 2015, NGM entered into a five-year research collaboration, product development and license agreement with Merck. Under the terms of the collaboration, Merck has a one-time option to license NGM313 upon NGM’s completion of a proof-of-concept study in humans. Merck is required to make a determination with respect to its option to license NGM313 by the end of 2018. The Phase 1b randomized, open-label, active-controlled parallel group study evaluated the safety, tolerability, pharmacokinetics and pharmacodynamics of a single dose of NGM313 in obese, insulin resistant subjects with NAFLD. 25 subjects were randomized 2:1 to either a single subcutaneous 240 mg dose of NGM313 (n=17) or a daily oral dose of 45 mg pioglitazone (n=8) for 36 days. 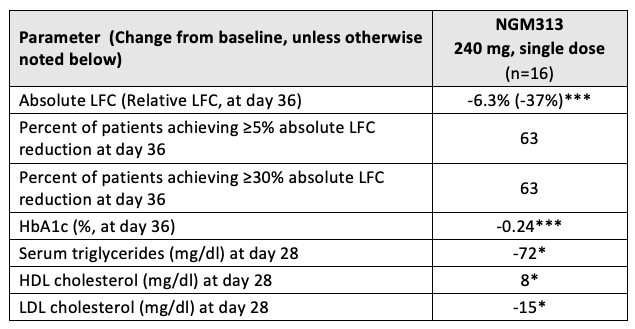 The primary objectives of the study were to evaluate changes from baseline in LFC as measured by MRI-PDFF at day 36 and changes from baseline in insulin sensitivity at day 29 in subjects treated with NGM313 as compared to pioglitazone. MRI-PDFF was performed at day 1, day 23 and day 36 and read centrally by a radiologist blinded to treatment assignment. Preliminary results indicated that a single dose of NGM313 resulted in a statistically significant least squares mean change from baseline to day 36 of -6.3% and -37% in absolute and relative LFC, respectively (p<0.0001), while the highest approved daily oral dose of 45 mg pioglitazone resulted in a statistically significant least squares mean change from baseline to day 36 of -4.0% and -25%, respectively (p<0.001). Furthermore, 63% of patients in the NGM313-treated group experienced a relative LFC reduction of ≥30% at day 36 after a single dose, as compared to 25% of patients in the pioglitazone treated group. A relative reduction of LFC of approximately 30%, as measured by MRI-PDFF, has translated into a favorable histological response as evidenced by a NAS improvement of two stages or greater. In addition, preliminary results from the study demonstrated that a single dose of NGM313 resulted in a mean decrease from baseline of 0.24% in HbA1c at day 36, as compared to a mean decrease of 0.11% with a daily dose of pioglitazone. A reduction in HbA1c of the magnitude observed in this study’s insulin resistant, non-diabetic patient population in this time frame supports the promise of NGM313 to potentially improve glucose control in type 2 diabetes patients. Neither group experienced hypoglycemia. Treatment with NGM313 also resulted in statistically significant reductions from baseline in the Homeostatic Model Assessment of Insulin Resistance (HOMA-IR), serum concentrations of fasting glucose, ALT, AST, triglycerides and LDL cholesterol, and a statistically significant increase in HDL cholesterol levels at day 28 (p<0.05). Preliminary data indicate that NGM313-treated patients had an increase from baseline in body weight of 1.6 kg at day 36, as compared to a 2.4 kg increase from baseline in body weight with pioglitazone. Patients treated with NGM313 did not experience hemodilution or edema. NGM313 was well-tolerated, with no serious adverse events. All adverse events observed during the course of the study were deemed mild, with increased appetite (12%) and injection site reactions (12%) being the only adverse events reported in at least 10% of the NGM313-treated subjects. NGM313, a proprietary, investigational agonistic antibody discovered by NGM scientists, works by selectively activating the β-Klotho/FGFR1c receptor complex, which regulates energy expenditure and glucose uptake in fat cells and other tissues. NGM313 binds to a unique epitope of β-Klotho, resulting in the selective activation of FGFR1c and signaling through the metabolic pathway utilized by FGF21-based ligand therapies. It does not trigger signaling through other FGF receptors, such as FGFR2c, FGFR3c or FGFR4, potentially minimizing risks associated with FGF21-based ligand therapies. In Phase 1 studies, NGM313 has demonstrated potential as a once-monthly injectable insulin sensitizer that was safe and well-tolerated.